Thanks Mary Treseler and Leah Buley for inviting me to present “Becoming a Designer Founder” at the O’Reilly Design Conference in San Francisco March 2017. Ladies That UX invited me to be the closing speaker at TalkUX 2016. As I transition from UX practitioner to entrepreneur, I am glad to share back what I’m learning with my communities. Hopefully I’ll inspire other UX designers to take the plunge! In this short video, I explain why I’m excited about what we’re doing at Brooklyn Copper Cookware, and why I think TalkUX is such an important event. You’ll have to wait a whole year for the next TalkUX in Taipei, Taiwan. Until then, you can sample the talks from this year’s conference, (or re-live the good times if you were there). Click here to see videos of the presentations from TalkUX 2016. Thanks to the kind folks at Blueprint for the interview and event videos! My friend Ben Yoskovitz, author of Lean Analytics invited me to present at the AB InBEv ZXlerator program on June 21, 2016. This talk was a new direction for me. Instead of talking “to” founders about what they should do, I’m now able to speak “with” founders and share my own direct experience. In this talk I discuss a common error of perspective founders can succumb to, illustrated with examples from my own company, Brooklyn Copper Cookware. How can we shape our skillsets to be effective participants in Balanced Teams? Complex software projects require a wide range of skills. As an individual who seeks meaningful work, you understand the need for cross-team communication and collaboration, but the skillset is overwhelming. What do you need to know? How deeply must you know it? First presented at the Balanced Team Summit 2015, Grand Rapids MI. 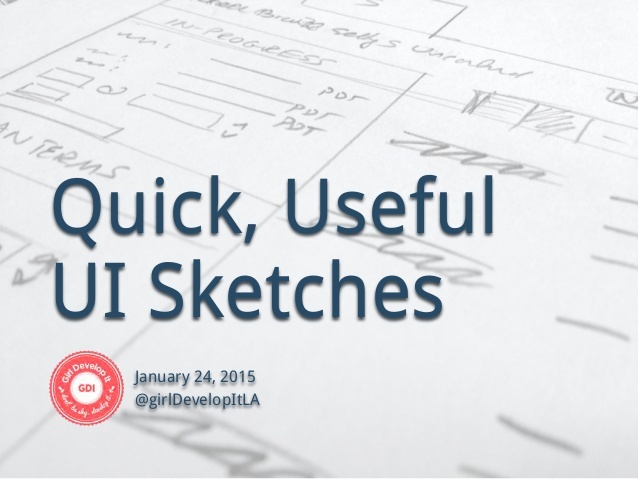 Workshop materials from my January 24th workshop “How to Draw Quick, Useful UI Sketches” organized by Girl Develop It, Los Angeles. Click here to view and download this presentation on SlideShare. I was invited to speak at the Downtown LA UX Study Group on the topic of UX Design Critique. You can look at the slides here, or download the deck from SlideShare. Here’s the list of resources I reference at the end of the deck. I enjoy the InVision newsletter because it includes great interviews with designers and useful tips, like this article from Andy Orsow called 7 tips for designing awesome animated GIFs. Here is the result of my little experiment. I made this animated GIF with Keynote and Photoshop. It was a pretty straightforward process and it was a fun way to learn something new. If you want to try it out yourself, please read on for a few more tips you might find helpful. 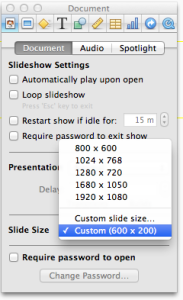 You can change the size of the “canvas” in Keynote by setting the slide size in the inspector. I choose 600×200 because that’s the width of graphics for my blog. You can pick any size that makes sense for your project. Turn on the rulers and drag some guides so you can orient yourself as you’re working. Once I imported the file into Photoshop, I immediately tried to Save for Web, but the GIF didn’t animate. I wasn’t sure what was wrong so the second time I imported it, I opened the animation panel (Window > Animation) and verified the playback was working before I exported. It was better to do it that way anyhow because I could tune the animation by extending time and removing frames. I found that I needed to extend the last frame to 1 second to make the animation look like there’s a little pause before it starts. 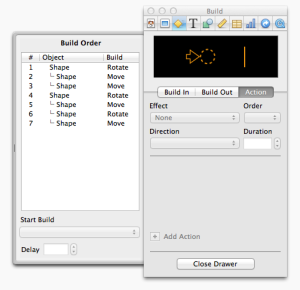 Please leave a comment if you found this helpful or leave a link to your animated GIF project. I’d love to hear from you. Here are some resources I’ve found fun/memorable/useful. Several of them cover more than one of the areas of mastery I mention above, so I have not categorized them. My friend Kate Rutter creates and shares amazing resources. If you get a chance to attend a workshop or hear hear speak at an event, do it! Although you might think that hand-lettering is just the territory of graphic designers and illustrators, I think it’s great for any hand-sketcher to have a couple different hand-printed fonts in their toolkit. The book has great examples and loads of different worksheets, so buy it on paper and practice, practice, practice! This book is worth getting on paper. It’s printed on nice paper and bound well so it’s a pleasure to read. The electronic version is not as satisfying. I first saw Dan Roam at SxSW 2010 when he launched “The Back of the Napkin.” He now has a several books and tons more resources on his site. The VizThink folks are an international community. They have interesting events and good resources. I’ve pulled together my current thinking about UI sketching in a workshop. I use a technique I call “reverse wireframing” to teach you to see the structure of UIs and through a series of exercises, you’ll create your personal shorthand to draw UI elements. Good luck, and please leave comments with your favorite resources! Are you challenged by unclear, conflicting and changeable product mandates? Frustrated by other team members who just don’t seem to “get it?” Do you struggle to find a sustainable pace where you can deliver what your team needs to move forward and still have a little time to think ahead? The increasing popularity of Agile development and Lean Startup have created an expectation of shorter cycles and iterative delivery, yet our teams still ask for for pixel perfect deliverables. At the same time, we are asked to deliver great experiences, advocate for the business value of good design and facilitate a more inclusive ux process with our teams. I believe we can thrive and do good work in this environment of continual change if we reconsider our UX workflow as a framework of tools and activities that can adapt to the needs of our products and teams.